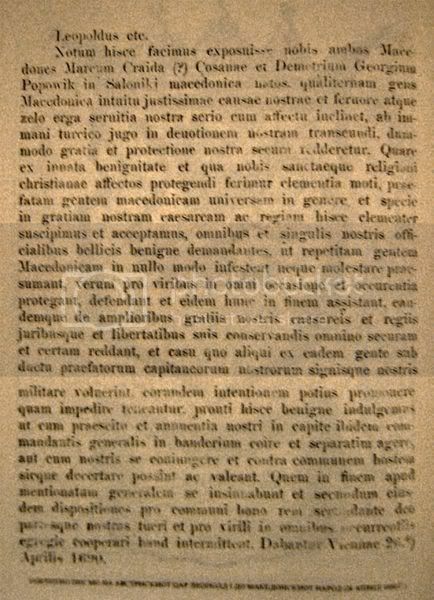 Macedonians ask for protection of the Holy Roman Emperor, Leopold I, 1690! 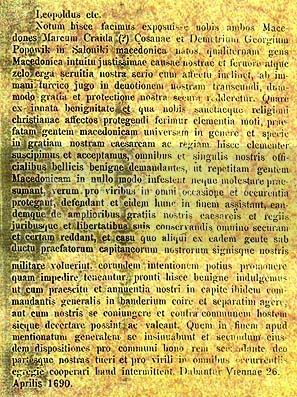 Here are two sources of the letter were the Macedonians ask for protection of the Holy Roman Emperor, Leopold I. The letter is from 26th April 1690. April 26th, 1690 Letter of protection from Leopold I. …This is to inform you that two Macedonians, Marko Kraida born in Kosana and Dimitri Georgi Popovic, born in Macedonian Salonika, have told us that the Macedonian people, with respect for our most righteous task, with devotion and zeal towards our service….we graciously accept them under our imperial and royal mercy and in any case and way the above mentioned Macedonian people, cordially recommending to each and all of our willing commanders not to attack the Macedonian people….Issued in Vienna, April 26th, 1690. Representatives: defenders of the Macedonian people…. J. Radonic, Prilozi za istoriju Srba u Ungarskoj u XVI, XVII and XVIII veku. Knj. I, Matice srpske, nbr 25 and 26, Novi Sad 1908, p. 52-53. Leopold I, Holy Roman Emperor (name in full: Leopold Ignaz Joseph Balthasar Felician; Hungarian: I. Lipót) Habsburg (June 9, 1640 – May 5, 1705), Holy Roman emperor, was the second son of the emperor Ferdinand III and his first wife Maria Anna of Spain. His maternal grandparents were Philip III of Spain and Margarita of Austria.